I bought my first racehorse in that truck, when it pulled an empty trailer up to Thistledown in Cleveland, Ohio and came back with the lovely Casanova. Less than a year later, I went back up to Ohio (Cincinnatti this time) and brought home the horse I would not only fall in love with, but who would take my career to its highest point – yes, I’m talking about none other than “Bub The Scrub,” Pirate, Baby P, The Gentleman Pirate…you’ve heard of him by now! That truck has been driven through rain, snow, sleet, ice, fog, mud, and deep sand, and has faithfully gotten my friends, my horses, and me wherever we’ve asked it to go, with rarely a complaint. Despite it’s day job as eventer truck, it has been to more than a few family beach vacations with beach chairs in the bed of it and The Briggs Family in the cab, and has had everything from The Avett Brothers and The Killers to The Beatles and The Rolling Stones blasted out of its stereo. That truck got me through my teenage years, and has even waited patiently in the parking lot at a handful of concerts, with a saddle and pair of boots in the front seat – pair of heels thrown carelessly on the floor, as they are much less important. Always, though, that truck’s most important job was getting me to events. 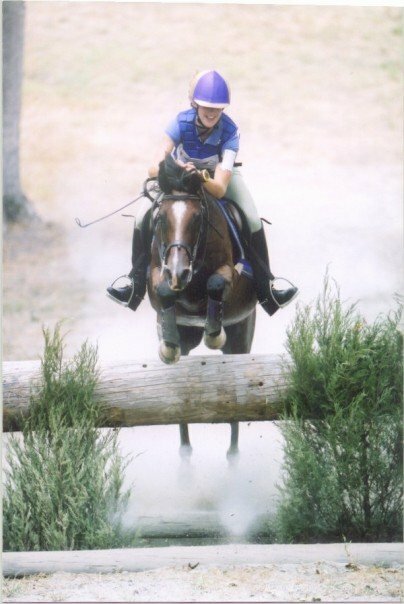 One of its first trips was, in fact, to the American Eventing Championships, where little 13.2 hand Laddy darn near won the Training (leading following cross-country) if not for his stifle slipping in the middle of stadium and being unable to finish…because even Wonder-Ponies can’t last forEVER, even though they try. 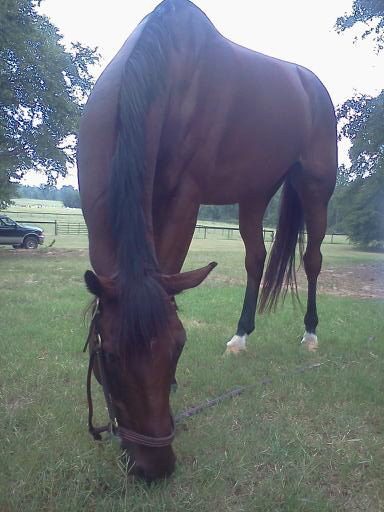 Pirate grazing after his great day of training at Tiffani's…the ol' Ford in the background! My good ol’ F350 most recently took Pirate down to Tiffani Loudon-Meetze’s, where we had a phenomenal dressage lesson and equally exciting jump lesson….P was better than ever, and if we can recreate any of that at the American Eventing Championships this week, I’ll be a happy girl. We also went down to Gibbes Farm for a cross-country school a couple of weeks ago, and my Baby P was the fantastic, bold cross-country machine I can always depend on. (It was there my truck again proved IT’s dependability by helping me get out of a bind when I somehow managed to drive it into the one spot on that lovely farm where the ground isn’t perfect and the sand is DEEP…it was a pretty epic save, I might add, and I was very proud of my slightly redneck methods to get it unstuck). So, ol’ Ford, get ready to leave for Georgia, because The Pirate and I are all KINDS of ready for the AEC…provided I don’t hurt myself on the Laddy Pony between now and then. Oh yes, my 20-yr-old Laddy came awfully close to landing me in the dirt the other day when he popped up a bank on our hack the other evening and threw the three biggest bucks I believe I have ever sat in my life….ohhhh, Laddy, you naughty pony, you! You’re rotten but I love you. Hey, at least it’s a comforting thought that, while nothing lasts forever…some things NEVER change. 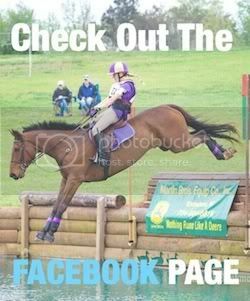 Posted in Blog and tagged with 3 Day Eventing, aec, American Eventing Championships, Cross Country, Dressage, Fox Hollow Farm, Kelsey Briggs, Kelsey Briggs eventing, Off Track Thoroughbred, Show jumping, The Gentleman Pirate, United States Eventing Association. RSS 2.0 feed. Love this post! Though I do have a Dodge…gasp… I do agree with you on my love for my truck. And mine too makes for a grand bed. Good luck in Georgia!